Objective There is evidence from the literature that dysfunctionality of the sympathetic nervous system of the foot with subsequent loss of local autoregulation could be a predictor of early amputation in patients with diabetes with a neuroischemic ulcer. To confirm this we tested the functionality of the sympathetic nervous system in the foot in a consecutive group of 31 patients with diabetes with critical limb ischemia and non-healing neuroischemic ulcer. Research design and methods Prospective cohort with retrospective analysis after 12 months of routinely acquired clinical data. All patients in the study group underwent angiography of the foot as part of a routine angioplasty procedure. Primary study endpoint was lower extremity amputation-free survival at 12 months. Because of the study design no other endpoints could be analyzed. The functionality of the sympathetic nervous system was tested with perfusion angiography. Results Thirty-one patients were followed for 12 months. The Capillary Resistance Index (CRI) was used to measure the response of the sympathetic nervous system. CRI≥0.9 is the cut-off point for a non-responsive sympathetic nervous system. All patients (n=11) with a CRI≥0.9 underwent a major amputation before 12 months. Of all patients with a CRI only 15% underwent major amputation. The positive predictive value for major amputation before 12 months for patients with a CRI ≥ 0.9 was 100%. Conclusions A non-responsive sympathetic nervous system of the foot is a strong predictor of early major amputation (log rank p<0.001; HR 14.22; 95% CI 3.64 to 55.51). Over the past 20 years some publications have suggested that a dysfunctional sympathetic nervous system of the foot could be a predictor for poor outcome of neuroischemic ulcer in patients with diabetes. These papers have never attracted much attention. The inability to reduce the peripheral resistance in the foot with a local alpha-blocker is a predictor for a local dysfunctional sympathetic nervous system of the foot and amputation before 12 months. Perfusion angiography offers a very simple test to evaluate the functionality of the sympathetic nervous system by measuring change in total blood flow through the foot. The initial clinical impact of our findings could be that in patients with diabetes with a Capillary Resistance Index (CRI)≥0.9, and a remaining or worsening non-healing ulcer after revascularization, a second intervention is probably in vain. 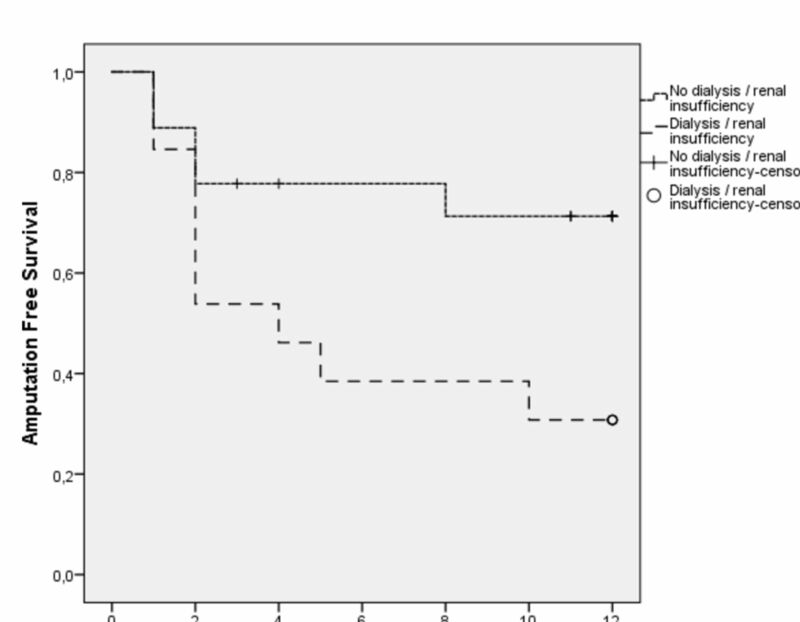 Whereas in patients with a CRI<0.9 a reintervention might be useful. This might be a cost-effective strategy, especially because this test does not add to the cost of the intervention. Until recently total blood flow in the foot could only be measured in the preclinical setting using either venous occlusion plethysmography or local isotope washout techniques.19 The new technique of perfusion angiography is able to instantly measure the total blood flow through the foot in the clinical setting.20 We used this new imaging technique to test the patients’ variable of the functionality of the sympathetic nervous system in a consecutive group of patients with diabetes with neuroischemic ulcer and matched this with the main outcome in these patients, that is, amputation-free survival (AFS). From our routine angioplasty population we prospectively followed a consecutive group of 34 patients with diabetes with critical limb ischemia (CLI; toe pressure <30 mm Hg) and a non-healing neuroischemic ulcer. Neuroischemic ulcer is defined as neuropathy and vascular disease as an important contributor. A non-healing ulcer is defined as a wound that does not improve after 4 weeks or does not heal in 8 weeks. CLI was defined as an absolute toe pressure <30 mm Hg in patients with compressible vessels. Neuropathy was identified in this study when the treating diabetologist has made a note of this in the patients’ medical record. Only patients with neuropathy were eligible for this study. All patients were scheduled for angiography and subsequent angioplasty between April 2013 and January 2017. Three patients were lost to follow-up after the procedure and were excluded from analysis. A total of 31 patients were included for analysis. Of this group, 24 patients had type 2 diabetes mellitus and seven had type 1 diabetes. All patients were using insulin. At our institute preintervention screening is done with Duplex/Doppler ultrasound only. Suitability for endovascular revascularization was determined during diagnostic angiography by an experienced interventional radiologist. All treated patients received 6 months of double antiplatelet treatment, and thereafter single antiplatelet medication. Secondary risk management and wound care were carried out in accordance with standard procedures at our hospital. In the clinical workup in our institution, diabetic ulcers are not always routinely scored with an ulcer classification system. Because this study was done based on the available routine data, a precise scoring of each patient is not available. In retrospect we could identify a mix of Wagner grades 1–4. Patients with severe gangrene (Wagner 5) are in our institution not considered primary candidates for endovascular revascularization. For this study we obtained a waiver from the local ethical committee, as all data were obtained as part of normal routine procedure and routine follow-up. No extra investigations or study-related follow-up appointments had taken place. Perfusion angiography is a postprocessing modality using standard digital subtraction angiographic (DSA) data. The technique of perfusion angiography has been described before.20 For postprocessing the DSA data we used the 2D perfusion software (Philips Healthcare, Best, The Netherlands). Briefly, with perfusion angiography the total flow (volume/time) through the foot, both the macrocirculation and microcirculation, is measured in a 2D region of interest. After injection of a standardized bolus of contrast the 2D perfusion software analyzed the change in density in each angiographic image voxel over time. To test the functionality of the sympathetic nervous system in the foot we blocked the alpha-adrenergic receptors of the arterioles locally using an alpha-receptor blocker (Tolazoline, Novartis, Basel, Switzerland). Four milligrams of Tolazoline (diluted in 10 cm3 NaCl 0.9%) was given through a 5 French end-hole catheter, with the tip in the mid-section of the popliteal artery. Blocking the alpha-adrenergic receptors results in instant dilatation of the arterioles, which only have alpha-adrenergic receptors, with direct lowering of the peripheral resistance and subsequent faster flow through the microcirculation. In patients with CLI the macrovessels will not dilate after administration of an alpha-blocker because these vessels are already maximally vasodilated by vasoactive metabolites released from ischemic tissue. On a graph faster total blood flow is represented as a curve with a lower peak, as passage of the contrast bolus is faster and subsequently there is less accumulation of contrast over time (figure 1). Time-density curves of a positive response and non-response to the Tolazoline administration. Yellow curve is foot perfusion before Tolazoline. Blue curve is foot perfusion after 4 mg Tolazoline intra-arterial in mid-popliteal artery. (A) Normal time-density curves. First part parallel and early peak of the blue. CRI=0.7. (B) Non-responsive time-density curves. Curves overlap, no early peak density. CRI=1.0. CRI, Capillary Resistance Index. A functional sympathetic nervous system is needed to elicit this response to Tolazoline.21 By comparing foot flow before and after local intra-arterial administration of Tolazoline, the response of the sympathetic nervous system can be tested. The response is measured as the Capillary Resistance Index (CRI), which is the peak of the flow post-Tolazoline divided by the peak pre-Tolazoline.20 This very low dose of Tolazoline has no systemic circulatory side effects. For more than 20 years Tolazoline in combination with angiography has routinely been used in our practice to obtain better flow and more optimal images in situations of local low flow.22 All perfusion angiography images were obtained under identical standardized conditions at both the start and the end of each procedure. We analyzed patients after a period of 12 months or until time of death. Time of amputation or death was derived from medical records. Baseline data were expressed as proportions (%) and means±SD. AFS was also compared in patients who underwent angioplasty and patients who did not undergo angioplasty. AFS was also analyzed in relation to type 1 or type 2 diabetes and dialysis or renal insufficiency. Finally, mortality was compared with CRI. Time to event was estimated using Kaplan-Meier survival analysis and compared with log rank tests. In addition, HRs with 95% CIs are given. Analyses were done with SPSS (V.23.0.0.2). Our observational study sample comprised 31 patients with a mean age of 68.9 (±12.9 SD), 21 (68%) patients were male. The baseline characteristics of the patients are listed in table 1. Twenty-three patients (74%) were technically suitable for angioplasty and underwent the procedure successfully. In eight patients with the vessel anatomy below the knee, vessel anatomy was not suitable for endovascular revascularization or bypass surgery. At 12 months’ follow-up, 14 patients (45%) had undergone a lower limb amputation. Nine patients died before 12 months’ follow-up, two at 3 months, two at 4 months, one at respectively 7, 8 and 10 months, and two at 11 months after intervention. Five of these patients had a lower limb amputation before they died. In all other patients the maximum follow-up was 12 months. We calculated the CRI of all patients at 12 months. We compared the CRI of all patients whether or not they had undergone amputation. 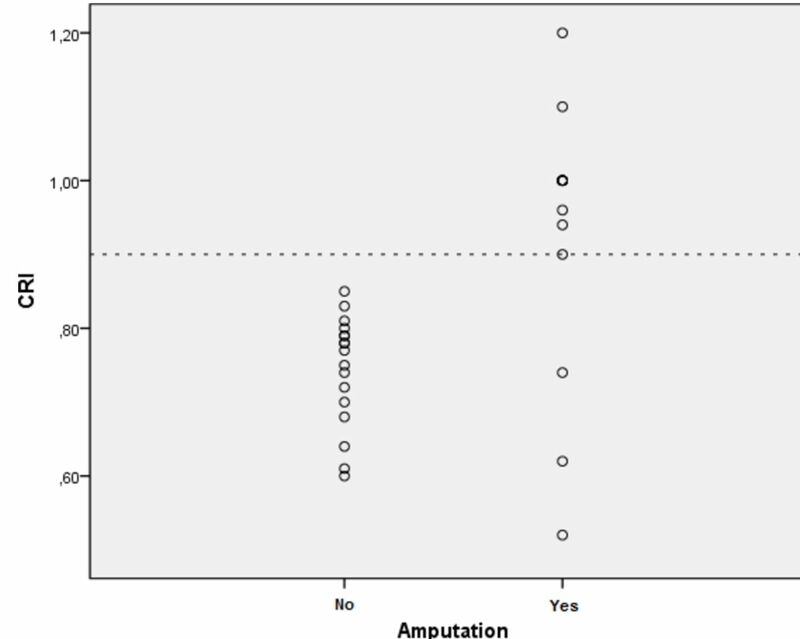 We made a scatter plot of the CRI in patients with and without amputation and found a cut-off point of CRI≥0.9 (figure 2). Scatter plot of CRI in patients with and without amputation. Fourteen patients did undergo an amputation. Most of these patients (n=11) had a CRI≥0.9 (of which six patients had a CRI=1.0). Three patients had a CRI<0.9 (0.52, 0.62 and 0.74). Seventeen patients did not undergo an amputation. These patients all had a CRI<0.9 (of which two patients with CRI=0.78 and two patients with CRI=0.79). Dotted line indicates a potential cut-off value of CRI=0.9 to separate non-amputated patients with a positive flow reserve from the amputated patients. CRI, Capillary Resistance Index. In the group of 20 patients with a CRI<0.9, three patients (15%) underwent amputation before 12 months. In the group of 11 patients with a CRI≥0.9, all patients (100%) underwent amputation before 12 months. This results in a sensitivity of 0.79 (95% CI 0.57 to 1.00), specificity of 1.00 (95% CI 1.00 to 1.00), PPV of 1.00 (95% CI 1.00 to 1.00) and NPV of 0.85 (95% CI 0.69 to 1.00). In this small first group of patients, the AFS showed a strong association (log rank p<0.001; HR 14.22; 95% CI 3.64 to 55.51) with the CRI (figure 3). The AFS was also calculated in patients who underwent angioplasty. Patients who did undergo an angioplasty had a slightly better AFS at 12 months, although this difference is not significant (log rank p=0.407; HR 0.65; 95% CI 0.22 to 1.94). For details see figure 4. There was no difference in AFS and type of diabetes (type 1 or 2; log rank p=0.699; HR 0.81; 95% CI 0.25 to 2.58). Kaplan-Meier curves for amputation-free survival in patients with CRI<0.9 and with CRI≥0.9 (log rank p<0.001; HR 14.22; 95% CI 3.64 to 55.51). Eleven patients with CRI≥0.9. Twenty patients with CRI<0.9. CRI, Capillary Resistance Index. Kaplan-Meier curves of amputation-free survival in patients who did undergo angioplasty and in patients who did not undergo angioplasty (log rank p=0.407; HR 0.65; 95% CI 0.22 to 1.94). Twenty-three patients did undergo angioplasty, eight patients did not undergo angioplasty. The AFS was worse in patients who had renal insufficiency (estimated glomerular filtration rate <30 mL/min) or underwent dialysis (log rank p=0.036; HR 2.88; 95% CI 0.96 to 8.64) (figure 5). Kaplan-Meier curves of amputation-free survival in patients who had renal insufficiency or underwent dialysis and in patients with normal renal function (log rank p=0.036; HR 2.88; 95% CI 0.96 to 8.64). Renal insufficiency=eGFR<30 mL/min. eGFR, estimated glomerular filtration rate. The number of patients with normal renal function was significantly higher in the CRI<0.9 group (p=0.010) (table 2). Mortality was also calculated in relation to CRI<0.9 or ≥0.9, and showed no significant difference. It is to be expected that in a selective study population of patients with diabetes with CLI and a non-healing neuroischemic ulcer the amputation rate is very high, as was shown in our results. In this small and selective study group the functionality of the sympathetic nervous system was shown to be a strong single variable with a high significance (log rank p<0.001) in predicting clinical outcome. The PPV for AFS of less than 12 months in this first series is 1.00 (11/11, 95% CI 1.00 to 1.00) in patients with a CRI≥0.9. 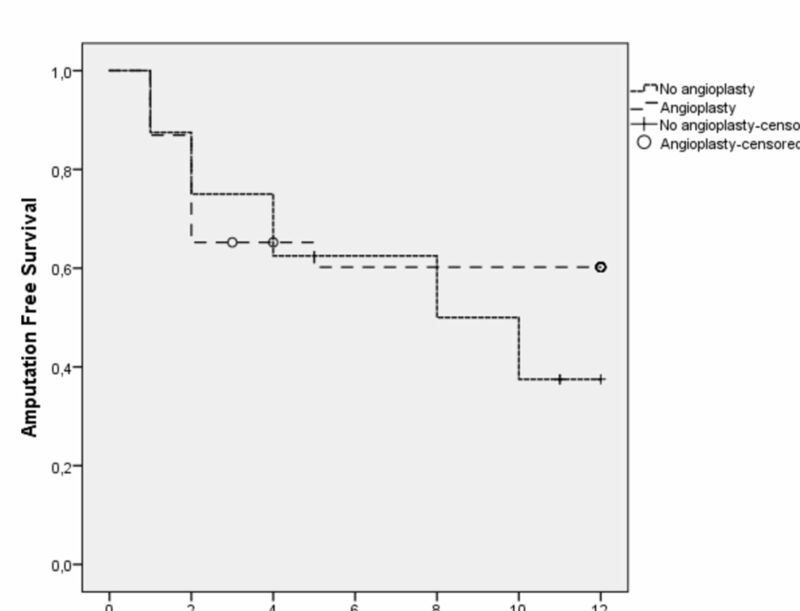 The NPV for AFS of more than 12 months was 0.85 (3/20, 95% CI 0.69 to 1.00) with a CRI<0.9. Significantly more patients with renal insufficiency or on dialysis were seen in the group with a CRI≥0.9. In patients with CLI, inflow arteries become maximally vasodilated by vasoactive metabolites released from ischemic tissue to improve the flow. During CLI, the arteries become resistant to vasoconstrictive or vasodilating drugs, known as ‘vasomotor paralysis’.26 However, we have seen that during local critical ischemia the sympathetic autoregulation system of the arterioles continues to be responsive to an alpha-blocker. Therefore, this test can only be used under local ischemic conditions where the arteries are already maximally dilated. In addition, it has become clear that the sympathetic nervous system also plays an important role in the defence against infection by initiating the inflammatory reflex.32 Therefore, poor functionality of the sympathetic nervous system could also be an explanation for the often uncontrolled and rapid spread of infection in diabetic foot disease. In conclusion we have shown that with the aid of perfusion angiography we now have a very simple and highly sensitive diagnostic test to investigate the functionality of the sympathetic nervous system in the foot in patients with a neuroischemic ulcer. By using this test we are able to predict the outcome more accurately. This test could potentially be used as a proxy test for microangiopathy. One of the advantages of this test is that it blends seamlessly with our current practice of endovascular treatment. The initial clinical impact of our results could be that in patients with diabetes with a CRI>0.9 and a remaining or worsening non-healing ulcer after revascularization, a second reintervention is probably in vain. 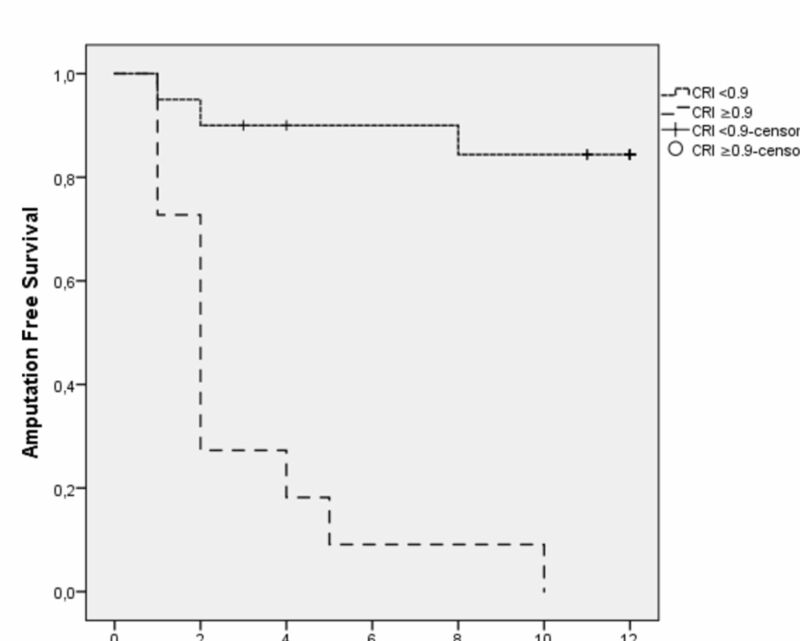 Whereas in patients with a CRI<0.9 a reintervention might be useful. This might be a very cost-effective strategy, especially because this test does not add anything to the cost of the intervention as it is a software algorithm using the routinely acquired angiography data. There is also no extra patient burden as the data are acquired during a routine intervention by an interventionalist. Although the outcome regarding AFS is highly significant, the limitation of this study is that it is still a small selective study population and that the analysis is based only on routine clinical data. Patients with severe gangrene (Wagner 5) are in our institution not considered primary candidates for endovascular revascularization. This might be a possible selection bias. Before this test can be used in daily clinical practice it should be evaluated in a larger prospective study.
. Autonomic diabetic neuropathy: skin sympathetic response and neurovegetative cardiovascular functionality tests. Funct Neurol 1992;7:115–20.
. Altman. Practical statistics for medical research, 1999: 230.
. Impaired autoregulation of blood flow in subcutaneous tissue of long-term type 1 (insulin-dependent) diabetic patients with microangiopathy: an index of arteriolar dysfunction. Diabetologia 1985;28:711–7. Contributors SMS: performing the study, data analysis and writing, final approval. MN and MJWK: study design, revising the manuscript, final approval. SB: study design, statistical analysis, final approval. JAR: study design, writing, data interpretation, revising the manuscript, final approval.